Residents sent running into the street after a magnitude-8.3 earthquake sit next to an equestrian statue in the main square of Santiago, Chile, Sept. 16, 2015. 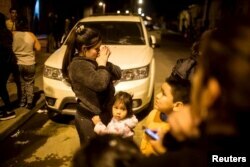 Authorities in Chile have ordered residents to evacuate the coast after a powerful 8.3 magnitude earthquake and four strong aftershocks prompted a tsunami warning. The Pacific Tsunami Warning Center says hazardous waves more than three meters above normal tides are possible for the entire Chilean coast. Higher than normal waves are also possible as far south as Antarctica and as far west as Malaysia. The U.S. National Weather Service has issued a tsunami warning for the Pacific island state of Hawaii. Tsunami sirens sounded in the port of Valparaiso in Chile. The mayor of the coastal town of Illapel, north of Santiago and near the epicenter of the quake, reported that one person was killed there, and the town is without power. Flooding has been reported in some coastal cities. Santiago has evacuated its main airport. Boats are heading out to sea and people on land are leaving coastal areas for higher ground. Wednesday's quake was centered about 500 kilometers north of Santiago and was felt as far away as Buenos Aires, on the opposite side of the continent. U.S. State Department spokesman John Kirby has said via Twitter that the United States stands "ready to assist as needed." He said "our thoughts are with the people of Chile tonight." A magnitude 8.8 earthquake and resulting tsunami hit south-central Chile in 2010, killing more than 500 people and destroying more than 200 homes. Residents stand on a street outside their houses after an earthquake hit Chile's central zone, Santiago, Sept. 16, 2015.